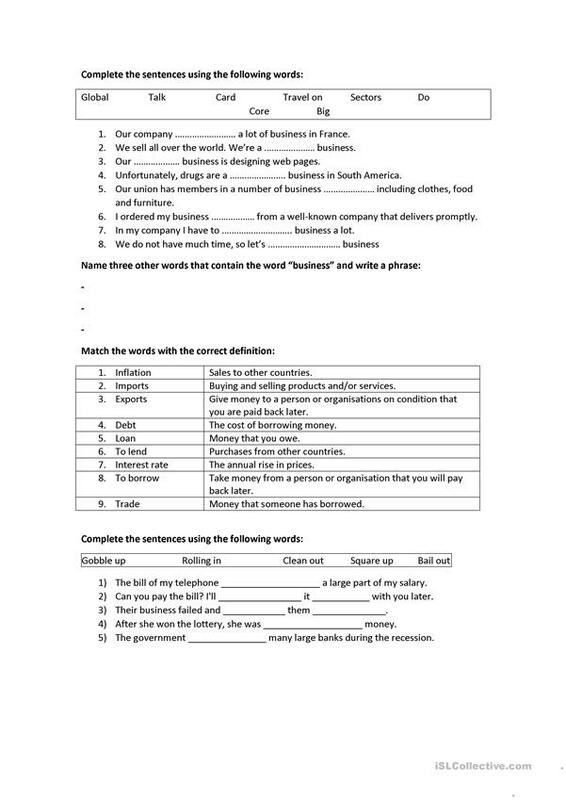 Business vocabulary and phrasal verbs. In includes different exercices where students have to match the word with the meaning and fill gaps with some words which are given. The above downloadable worksheet is a great resource for business/professional students and adults at Upper-intermediate (B2) and Advanced (C1) level. It is aimed at consolidating Phrasal verbs in English, and is useful for honing your learners' Writing skills. It focuses on the topic and words of Money. aidawind44 is from/lives in Spain and has been a member of iSLCollective since 2014-02-28 15:28:46. aidawind44 last logged in on 2017-11-18 11:45:13, and has shared 1 resources on iSLCollective so far.